How can we encourage our children to help the community, learn about other cultural traditions, and make a lasting memory at the same time? For the students of Raymond Elementary School and Jordan-Small Middle School, the answer to all three of these questions took the form of a Mardi Gras parade! those in need at the same time. 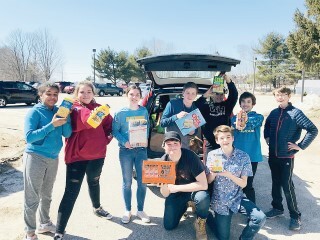 Last week, both Raymond schools collected donations of non-perishable food items to stock the Raymond Food Pantry, a volunteer organization staffed by the Raymond Lions. On Friday, all the food that had been donated by students, parents, teachers, and staff at both schools was collected during a Mardi Gras parade in the Raymond Elementary gymnasium. “Did you learn anything about Mardi Gras?” I asked, pushing the difficult journalistic questions. A bit of research on my part validated my daughter’s explanation. Apparently, Mardi Gras revelers in New Orleans used to travel door-to-door singing, dancing, and begging for offerings to make a communal meal of gumbo. They wore masks while doing so, in part for the fun, and in part to conceal their identity. Masks remain a large part of the excitement in most Mardi Gras celebrations, even the celebrations taking place at our own elementary school. This Mardi Gras tradition of celebrating while helping those in need has now become a part of our community as well. Last week’s Mardi Gras parade at the two Raymond schools raised over 500 pounds of food for the Raymond food pantry, a significant donation whose positive effects will be felt across our community. “Our school community has come together again to help our greater town community and it is to the great credit of all that we were able to pull together so much to help those in need,” explained Randy Crockett, the principal of both Raymond Elementary and Jordan Small Middle School. Hopefully, the students who attended the Mardi Gras parade and donated food to help their neighbors will carry a lasting memory of how satisfying and fun it can be to give back to your community.